If you've been in Madison Square Park around lunchtime this week, you might have noticed something out of the ordinary. 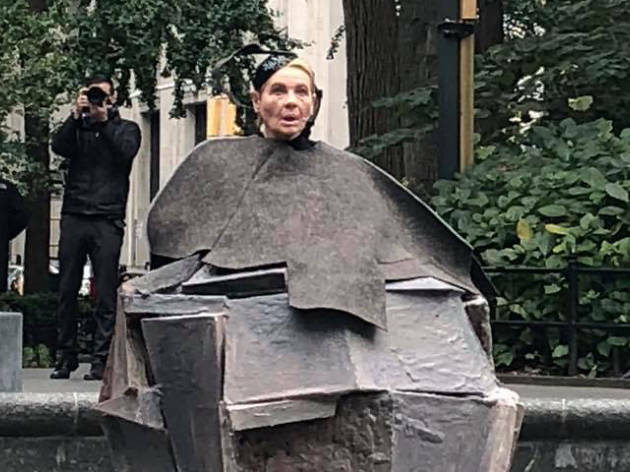 Or maybe you just walked by and somehow didn't notice that two-time Oscar winner Dianne Wiest was there outdoors in the park, dressed as a giant boulder, performing text by Samuel Beckett for anyone who chose to listen. Wiest's free performance, titled Passing, consists of excerpts from Beckett's bleakly funny Happy Days, in which she starred at Theatre for a New Audience last year. Her character, Winnie, is buried up to her waist in a scorched post-apocalyptic landscape, and then, later, buried up to her neck—yet she counts her blessings and yammers hopefully on. The actress, who is really just one of the very best actresses we have, will perform it daily (weather permitting), from noon through 1pm, until Friday, October 26. Her rock-star outfit is designed by artist Arlene Shechet, and Passing is presented as part of a larger installation by Shechet called Full Steam Ahead, which will be at the park through April 28, 2019. Unlike poor Winnie, spectators are free to come and go as they please, catching fragments of the performance or staying to watch the whole thing. 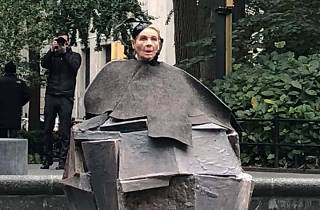 But honestly, how often do you get a chance to see Dianne Wiest act Beckett while trapped in stone? No one in New York this week has better plans for lunch. Adam is the Theater and Dance Editor and critic for Time Out New York and is the president of the New York Drama Critics’ Circle. Follow him on Twitter at @FeldmanAdam.